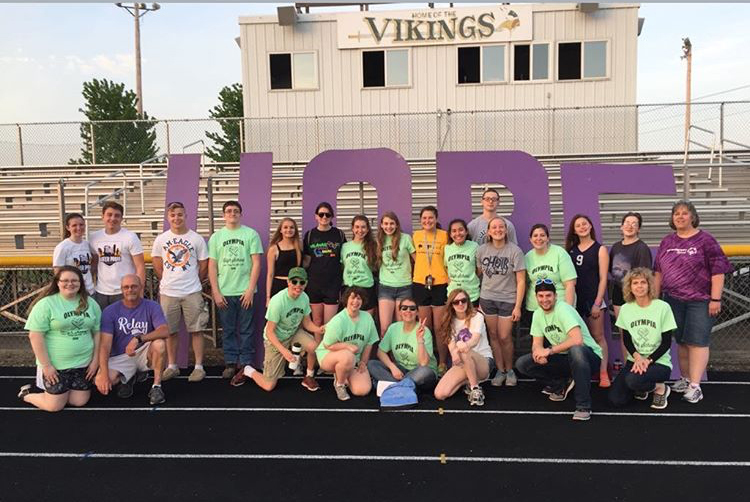 On Friday, May 11, Olympia students participated in the McLean County Relay for Life; participants promoted fundraisers beforehand and did a number of activities during the 12 hour long event. Relay for Life is a community based fundraising event for the American Cancer Society. Some of the events are 12 hours long, while others are 24 hours long. All of the high schools in McLean County were involved, making it a fairly large meet. Prior to the event, students raised money for the event; one of the methods through selling T-shirts. During the Relay for Life, participants walked the track from 6 P.M. to 10:30 P.M., with some special laps being formed as the evening went on. Afterwards, students engaged in indoor activities until 6 A.M.. Games and food were available throughout the session. Olympia was able to raise $1,300 for the relay. Total proceeds from all schools at the event added up to $17,281. Congratulations to all of the students and staff that participated in and raised money for this year’s Relay for Life! Best wishes for next year’s event!